Rocketmatter and MyCase are two of the leaders in cloud-based case management software. There are other companies that offer similar solutions, such as Clio, HoudiniESQ, and TotalAttorneys, to name a few, but I have not reviewed those here. You’ll notice that in this article, unlike other online reviews, I’ve decided to keep out screenshots for the most part. Lots of programs look nice, but once you start using them you realize the faults. I’ve written before about the benefits of cloud-based computing and why I think it is the wave of the future for solo attorneys and small law firms. One of the most important pieces of a cloud-based system is to invest in a case management program. For almost two years, I have been using Rocketmatter as my case manager. It has a clean interface and is fairly easy to use. However, for a number of reasons that I will get into below, I’m in the process of transitioning to MyCase. This is probably one of the biggest drawbacks, in my mind, to using Rocketmatter. It is also one of the biggest reasons that I am making the switch to MyCase. Rocketmatter’s task management system is, to be bluntly honest, completely unusable. It allows you to enter tasks, assign them to a matter, set a due date, and assign them to a user. However, that is about it. Once you have created a task in Rocketmatter, it get’s added to the homepage for the matter it is assigned to, as well as the “dashboard” page of Rocketmatter. The tasks are listed in random order, there is no way to sort them (unless you click on the main “tasks” page and then drag and drop the tasks into the order you want them). If you are trying to figure out, at a glance, which tasks are coming due soon, or might even be due today, good luck sorting through your tasks. 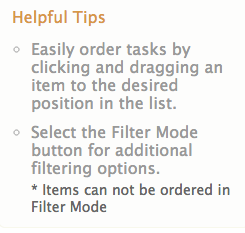 So Rocketmatter’s tip is to “drag and drop” the item to the desired position on the list? In addition, Rocketmatter does not allow you to post comments on your tasks, add more information in the form of a “description”, or categorize tasks according to importance. MyCase, on the other hand, has an extremely robust task manager. It shows you upcoming tasks on your homepage, grouped by due date. In addition, if you click-through to a certain task, there is a section for comments from other users (maybe your assistant has a question for you about a task you assigned him/her – this would be the place to ask it). One of the best features of the McCase task manager is the ability to make one “master” task, such as “open new client file” and then include an unlimited number of sub-tasks within that task. So rather than assign your assistant 5 different things that you want them to do when opening a new client file, you can assign them one task and keep tabs on the progress of that task based on how many of the sub-tasks have been completed. This is extremely useful to me, especially because I have so many documents that I am waiting for approval from client’s on. So my master task might be to “send settlement proposal to opposing counsel”, and the sub-tasks may include: review and analyze proposal from OC, draft opinion letter to client with proposed settlement, receive approval from client to proposed settlement, and finally, send out proposed settlement. Another fantastic feature of MyCase that relates to the Task Manager is the development of a function called “workflows”. Essentially, MyCase understands that attorneys do a lot of repetitive tasks, and have made it extremely easy to systematize your practice around these tasks. With workflows, you can set up a master task template that you can then use over and over without retyping all the tasks and due dates. This is genius, and is something that I have been looking for ever since I started my law practice back in 2010. To be honest, I haven’t started working with workflows much yet, and if my opinion of MyCase changes after I do, I’ll post an update. With regards to task management, the edge goes to MyCase. Billing and tracking time is the highlighted feature of Rocketmatter. And I think that Rocketmatter does a pretty good job. On the plus side, Rocketmatter allows you to bill from just about any screen, task, calendar event, etc. In addition, Rocketmatter has a built-in timer so that you can track how much time you spend on a case and then enter your time entry. The only problem with this increased functionality of Rocketmatter is that I never used it. I just keep the timer window open and track my time that way. Although it sounds great in theory, it was extremely difficult to track my time within a given task because if I wanted to click away from that screen to somewhere else in Rocketmatter, I would lose the time! It’s a small glitch that ruins an otherwise great idea. Other than that, Rocketmatter has a fairly robust reports section, and it shows you on the dashboard how many hours you have billed per day, week, month, etc. The trust accounting system works fairly well in Rocketmatter, although it is frustrating that I can never just enter a withdrawal or check from my trust account for a client to pay a case-related invoice. I have to enter this information as an “adjustment”, which looks awkward on the bill. I think that what Rocketmatter was going for here was to encourage you to enter this item as an expense, then bill for it and have the money withdrawn from your trust account. This is too many steps and too impractical for my practice. Rocketmatter does allow for a customizable billing template which, to be honest, I have left alone. The default bill layout is ugly and not user-friendly. Rocketmatter really needs to work on this, it’s a major drawback of the program, in my opinion. As for MyCase, there is a built-in timer at the bottom of the screen that allows you to track your time and bill for it. It shows you a running total of the number of hours you have billed for the day, week, month, etc., just like Rocketmatter. There is a reports section in MyCase which has every report you might need (billings by user for a given period, etc.). The trust accounting portion of MyCase is intuitive, but again, I haven’t gotten too much into it just yet. I do like that McCase will integrate with your credit card processor so that you can bill your clients and have them replenish their trust accounts online without calling in their credit card. (Rocketmatter seems to allow for this as well, but it is not a major focus of their software and I never tested the feature). I have run a few sample bills through MyCase, and so far the results have far exceeded anything I’ve experienced with Rocketmatter. The bills are simple and easy to read. My logo was automatically added to the top of the bill and it was easy to generate a pdf of the bill for the client file, if needed. Both programs integrate with Quickbooks, although I have not used this feature for either program. Because of the simplicity of the system and the user-friendly nature of the bills it produces, my nod goes to MyCase again. 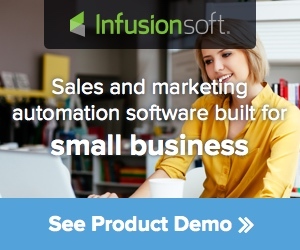 Both programs sync with your Google Calendar, which is standard in todays online world. However, MyCase only allows for one-way sync (you can add events through MyCase that will sync with your google calendar, but not the other way). Their website says that two-way syncing is coming soon. However, I don’t know how necessary it is because of the robust and easy to use mobile app that comes with MyCase. Rocketmatter has a fairly basic calendar – you can assign events to matters, input a location (one field), and type in some notes about the event. Rocketmatter also allows you to bill automatically, directly from the calendar event with a check box next to the user that would create the billing entry. However, because this time is tied to the time allocated for the meeting, and not for how long you actually spend in the meeting, I rarely (if ever) use this feature. Rocketmatter does allow for two-way syncing with google calendar or iCal, but I ran into glitches when I tried it, so I stopped using iCal and just started using the Rocketmatter mobile app to add calendar entries when I’m out of the office. MyCase offers many of the features of Rocketmatter, with the exception of the billing entry when entering an event – which I never used anyway. However, this is another area where MyCase really thinks about the user and shines with a couple of simple features that I love. First, MyCase allows you to enter in the address of the location where the event will take place. You can also save this location for future use if you would like. Second, MyCase syncs with Google Maps to show you a map of the location and give you automatic directions if you need them. This is especially helpful if you use it in conjunction with your smart phone or tablet. Finally, MyCase send you (and your client if you set them up with online access) an email reminder of the event. So if you have a court date coming up, MyCase will automatically generate an email to your client to remind them of the court date at a predetermined date in advance (1 day, 5 days, etc.). This email will include the specifics of the event, as well as the Google maps location for where the client needs to go. I don’t think there is any doubt that MyCase wins here too. Both programs are intuitive and easy to use. There is really no advantage to one option over the other. One of the benefits of cloud programs in general is how easy they typically are to use. That being said, I think that MyCase is a tad faster – but this is just being nit-picky. Rocketmatter displays a big rocket on the screen for a couple of seconds anytime you click-through to another area of the program. Now that I am more aware of it, it can get annoying. With MyCase, when you click somewhere, it just flows to the next screen as with any other website. Ease of use is a draw. Both Rocketmatter and MyCase allow for email integration. This is accomplished in Rocketmatter by setting up a unique folder within Gmail that is assigned to each of your clients. You can then create filters or rules that automatically direct emails to/from that client into the folder. Once you have created the folder in Gmail, you can sync that folder with the matter in Rocketmatter. It’s fairly easy to do, but there is no control in place to make sure all of your users do it. You would need to either program each user’s Gmail account every time you get a new client, or rely on the end-user to do so. MyCase has one master email address that you forward received emails to, or BCC other emails that you send out. Once the email is sent to MyCase, it is automatically filtered into the appropriate case file. If MyCase can’t figure out which file to put it in, then you can sort the emails manually (or have your assistant process them). I’ve been testing this feature out this week, and so far, it seems to work well. The biggest struggle will be with training my assistant to forward the emails into MyCase, but once she starts doing this, I imagine it will become habitual for her. Another advantage to MyCase is that you can send emails directly within the system – as long as you are sending them to a user that is already listed as a contact (which all your client’s should be). Using this in conjunction with TextExpander (for your signature), and keeping emails organized by matter should be fairly easy. Because there is no “set-up” for each matter, and user to get the email integration to work, I’m going to give the edge to MyCase. Both programs allow for you to upload files to the system. Rocketmatter allows you to “tag” documents as certain types of correspondence. Rocketmatter also allows you to sync with Dropbox or Evernote, and I have heard that an integration with Box is coming out early next year. Many lawyers that use Evernote for their document management will love this feature. MyCase, however, does not currently integrate with any third-party vendors, which is a major drawback in my opinion. Their rationale for this (it seems to me) is that it isn’t necessary because they already allow you to upload multiple documents to the system. 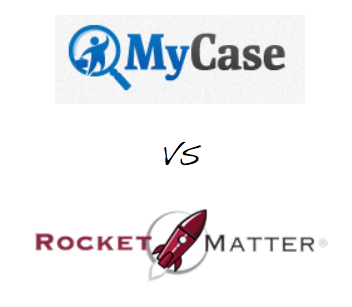 Both Rocketmatter and MyCase allow you to automate documents. However, I have not used this feature with either program. Rocketmatter did not have this feature when I first signed up, and I did not want to spend a lot of time learning how to set this up if it didn’t work properly. However, I do anticipate implementing this after I switch to MyCase. The edge here has to go to Rocketmatter because of the third-party integrations with Dropbox and Evernote. This is another area where MyCase really shines and has the head and shoulders advantage over Rocketmatter. Rocketmatter’s mobile app is extremely basic – it is clear that the developers at Rocketmatter have spent no time or money investing in this application. It shows you a list of cases, a list of contacts, your calendar, and a very basic billing screen with a timer and a button to allow you to enter your billable time. In addition, Rocketmatter forces you to enter your password every time you sign into the mobile app, which is helpful to keep your application secure, but often unnecessary if you have locked your phone. MyCase, on the other hand, has a robust and useful mobile app. The main page of the app shows you the upcoming events for that day, the number of tasks you have for the day, the number of hours you have billed thus far, and a log of all the recent activity for your firm. At a glance, you can see who is doing what at your firm, even if you are out of the office. You can add or edit events, tasks, contacts, time entries, messages, notes, etc., just as you can with the desktop program. In addition, you can set a 4-digit pass code and determine when MyCase will require the pass code to get back into the app. The Hands-down winner here is MyCase. Both programs allow for a client to sign on and access their case. I have not used this functionality in Rocketmatter, but can see myself doing so with MyCase. One of the great features where MyCase again has the edge is the ability to send client’s a reminder message prior to an upcoming court hearing. A client can sign into MyCase anytime of day, 24/7, and have immediate access to what is going on in their file. I presume this is true of Rocketmatter also – but again, I have not tested Rocketmatter’s client portal as of yet. This is another draw. I just don’t have enough experience using this feature to compare the programs. Rocketmatter is clearly built around a “billing” platform. It offers multiple ways to bill for your time, through tasks, calendar entries, notes, a regular time, etc. Even though this seems helpful and was one of the main selling points when I originally switched to Rocketmatter, there are a lot of other areas of the program that fall short as a result. Rocketmatter does have a fairly powerful “tagging” feature so that you can categorize certain cases, priority items, etc. However, any user can assign any tag to any item. I imagine in a big firm that this would become chaotic quickly. There is no check on who can create what tags or when they should be applied. I tried to use this method with my assistant to categorize cases as flat-fee vs. hourly, open vs. inactive, etc. and was constantly finding that they were not tagged properly. This is no fault of hers, it is just a hard system to manage that way. MyCase has built a total platform that works extremely well and is easy to use. The bills look professional without any tweaking. The mobile app is, to put it bluntly, awesome. MyCase’s task manager and workflow feature is brilliant. The client portal is promising. Rocketmatter charges $59.99 per month for the first user and $49.99 per month for each additional user. I called them to ask if they would give me a third user for $39.99 (a part-time contract attorney who would barely use the program except to track her time) and was initially told that they could not do that. When I persisted, they told me they would send this issue to a manager and I would receive a call back. That was three weeks ago, and I never received a call. Rocketmatter does offer discounts if you pay on a quarterly or annual basis. MyCase, in addition to all the other benefits of the program, is one of the least expensive case management programs out there. They charge $39.00 for each attorney user and $29.00 for each staff user. In addition, if you are a member of the ABA, you receive an additional 20% off your monthly fees for as long as you use the product. I called MyCase to ask about this discount and got someone on the phone immediately who processed the discount within 30 minutes and sent me an email confirmation. So I am currently paying $109 per month for Rocketmatter, and after the ABA discount, will be paying $54.40 per month for MyCase. At 50% of the cost of Rocketmatter on a monthly basis for the same number of users, this is a no-brainer. The edge on pricing goes to MyCase. I very much appreciate the product that Rocketmatter is trying to put together. Unfortunately, by ignoring my request to give a discount on the third user I started shopping around and found a far superior product in MyCase. I’m not one to switch a product like this without good reason. However, MyCase is clearly the winner here in almost all areas. If you are thinking about investing in case management software, I strongly recommend that you consider MyCase for your needs. Questions or comments? Feedback on this article? Please feel free to post a comment below.